Learn about the equipment we use on the farm. Learn about farming and discover new information. Our Farm is located near Muleshoe in the southern panhandle of Texas near the New Mexico state line, altitude of about 4000 feet and annual rainfall of about 16 inches. Jimmy began farming in 1979 with 160 acres, we gradually increased that amount to try to stay efficient enough to stay in business. By 1993 we were farming approximately 1500 acres, and at that time we started organic farming practices on 250 of those acres. Today, we farm about 2500 acres, mostly irrigated, down from our peak of 4500 acres. Approximately 2400 of these acres are certified organic by TDA/USDA. 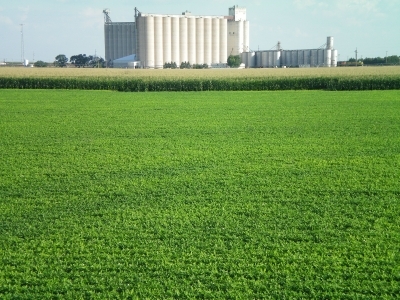 The organic crops we grow are: Yellow Corn, Soybeans, Wheat, and Cotton. We basically got into the organic business, because we were tired of making very little profit from our farming operation. But of course the reality today is that we have discovered and fully appreciate the environmental benefits of organic farming, and we would never go back to conventional farming——and if organic profits were to diminish “we would rather quit than switch”.